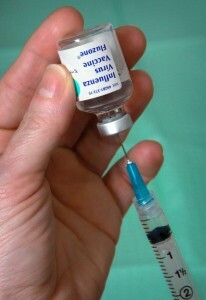 Two different influenza vaccines will be available in the fall of 2009. One will be a trivalent preparation comprising seasonal influenza H3N2 and H1N1 strains, plus an influenza B virus strain. A monovalent vaccine will also be available against the 2009 pandemic H1N1 strain. Many readers of virology blog have asked why these four virus strains will not be combined into a single, tetravalent formulation. I posed this question to Dr. Ruben Donis, chief of the molecular virology and vaccines branch at the U.S. Centers for Disease Control and Prevention. Here is his answer. Regulatory considerations: there have been no clinical trials with tetravalent influenza vaccines, and there is little time to do them now. Licensing without data is not a favored option. However, clinical trials for a monovalent have been started and will help establish appropriate doses, formulations, in different population groups. Public health considerations: the populations at greater risk of severe outcomes are not the same for the seasonal viruses and the H1N1 – pregnant women are high on the list for receiving H1N1 vaccine. Timing considerations: Seasonal vaccine will be available in September whereas pandemic H1N1 vaccine will become available later. …a trivalent with pandemic H1N1 would entail eliminating one of the current seasonal viruses – we don’t have evidence that any of the three seasonal viruses is becoming extinct. I thank Dr. Donis for responding. Is there some upper limit to how many different strains you can put in the vaccine before you start losing effectiveness? That is, why not put ten strains in, instead of three? I assume whatever limit exists is not too low, at least not based on your immune response, since it's absolutely commonplace to get a bunch of vaccinations on the same day. Another reason is that the vaccine for the 2009 pandemic H1N1 strain may require two doses for an adequate immune response, while people who have previously received seasonal trivalent influenza vaccine may only need one dose of seasonal vaccine. the immune response is weak. The little matter of clinical trials being necessary before ANY change in compostion of a vaccine raises its ugly head, again…which is why we will have 3-in-1 (H3N2, old H1N1 and B) and single pandemic H1N1 vaccines this year. However, there seems to be considerable and accumulating evidence that pandemic AH1N1 2009 in the southern hemisphere is almost completely replacing the standard seasonal variants: see http://www.cdc.gov/h1n1flu/updates/international/ . This means that maybe you'll only need the one vaccine, come flu time in the north? 2009 H1N1, or maybe a drifted variant.